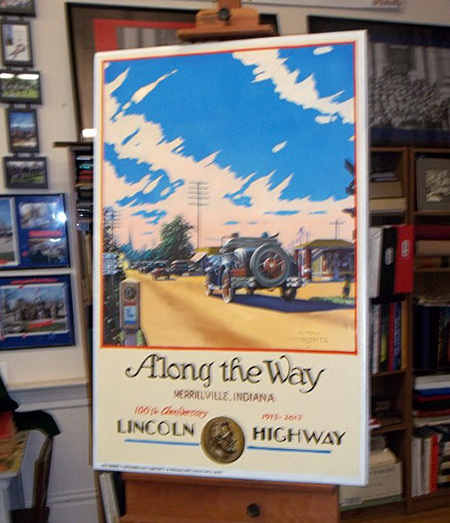 A new poster commemoratees the forthcoming centennial of the Lincoln Highway in 2013. The Merrillville-Ross Township Historical Society Museum of Merrilville, Indiana, commissioned Mitch Markovitz to create the evocative image. In his oil-on-canvas painting that is reproduced as a poster, Markovitz of Knox, creates a scene from 1929 when the Lincoln Highway was a major thoroughfare that led to Broadway and then north to Gary and Chicago…. Jeff Blair, Indiana’s national director on the Lincoln Highway Association, traveled from Leesburg, Ind., to witness the poster’s unveiling. “Last year, I walked the Lincoln Highway west from Ohio to Illinois for charity. Next May, I’m going to walk east from Illinois to Ohio and I’ll pass right by here on the first day,” Blair said. The article claims that the poster shows a 1929 Ford Model T, which is impossible. More likely it’s a Model A, though just as perplexing is why the image is said to portray the LH in 1929, a year after the LHA ceased active operations. Perhaps it was to include a 1928 concrete post, but that too is in an incorrect orientation, i.e., not facing the road. Bernie Queneau, the Lincoln Highway’s best-known ambassador, celebrates his 100th birthday today. In 1928, he was one of four Eagle Scouts to cross the Lincoln Highway (at 16) as part of a Scouts’ Safety Tour, which also promoted the highway and its marking that September with thousands of iconic concrete posts. 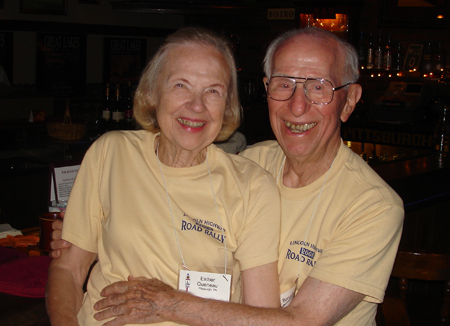 I was fortunate that in 1997, LHA president Esther Oyster arranged with me to interview 85-yr-old Bernie at my workplace, the Heinz History Center. Years later they returned—together—and took me to lunch to announce their engagement! They were married in 2003 and continue to explore the world together, showing up a few weeks ago at the LHA conference in Ohio. That’s Bernie and Esther Queneau a few years ago at a LHHC event. Today would also have been the 100th birthday of Woody Guthrie, known for his folk songs more closely associated with Route 66. 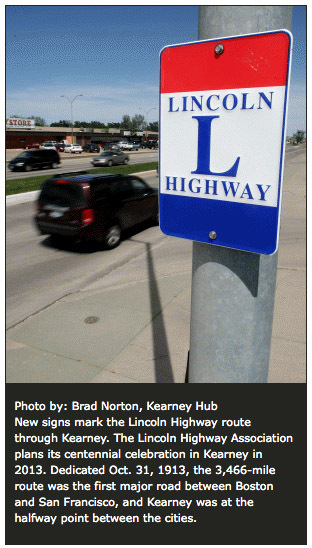 The Lincoln Highway Association is also celebrating its centennial this year, culminating in a celebration July 1, 2013. 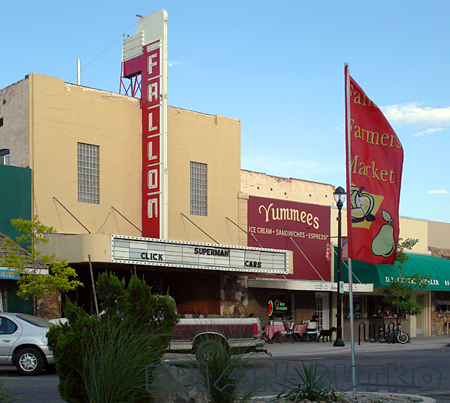 Fallon, along the Lincolon Highway in western Nevada, is today celebrating its centennial of becoming an incorporated city. According to the Lahontan Valley News, there was no town at the turn of the century until rancher Mike Fallon sold his land to Warren Williams in 1903, who then began selling lots on what is now the west end of town. The eastern part was established on land owned by John Oats. “Initially, Fallon was a mining town, and in 1919 the city experienced an oil boom. Growing alfalfa has been and is still one of the most stable income for local farmers. Currently, the valley’s 30,000 farming acres produces an average of 5 tons per acre — 70 percent is shipped out of state.” Mert Domonoske, past mayor of Fallon for 16 years, said when he moved to Fallon in 1948, there were about 2,300 residents, and the only road leading out of town was a two-lane highway. Now “The Oasis of Nevada” has 8,000 citizens. Events run this evening from 6-8 pm starting when the current mayor and council members arrive at Oats Park by horse-drawn Wells Fargo stagecoach. Festivities will include a bonfire, food, drinks, church bells ringing, musical performances, and singing “Happy Birthday” with a big birthday cake. Just bundle up – freezing temps are predicted all day and week. Above, The 10 Millionth Ford (with Lincoln Highway markings) arrives at San Francisco, California, 1924. Drive Frank Kulick is handing Mayor J. Rolph a letter from Mayor Hylan of New York City. Courtesy University of Michigan, Special Collections Library, lhc3000. A transcontinental tour of Ford Model Ts was launched on May 5 in honor of the car’s centennial. The “Sea to Sea by T” tour is traveling from Baltimore to Los Angeles via Route 40 and Route 66, missing the Lincoln Highway but nonetheless of note to old car and highway enthusiasts. The cars were shipped to Baltimore last month and the participants flew in May 3rd to start the tour. A sampling of overnight stops includes Springfield MO on May 13; Amarillo TX on May 17; Albuquerque NM on May 21; Williams AZ on May 24-25; and arrive LA on May 28. Details are scarce; the national Model T Club recommends contacting the Model T Ford Club of Southern California c/o Lee Chase (323) 938-4601, though most of what they know is reported here. Also note that the Model T Ford Club of America and Ford Motor Company will honor the 100 year birthday of the Model T with an official celebration July 21-26, 2008 at the Wayne County Fairgrounds (861 Salisbury Road N) in Richmond, Indiana, which is 60 miles east of Indianapolis & 35 miles west of Dayton, Ohio. Click the logo above for more info. Henry Ford chose not to align with the Lincoln Highway Association or any road that depended on private funding, but his son Edsel supported their efforts, most famously with a tour of the 10 Millionth Model T along the Lincoln Highway in 1924.